Violin Piano Acc.. Edited by Sel., transcr., and ed. Samuel Applebaum. String Series. 48 pages. Alfred Music #00-EL95103. Published by Alfred Music (AP.EL95103). ISBN 0769230679. English. Sel. ; transcr. ; ed. Samuel Applebaum. 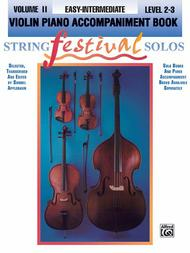 String Festival Solos are economical collections of transcriptions by Samuel Applebaum. In two volumes for each instrument, the solos are in progressive order of difficulty. Each volume contains nine pieces -- all classic titles in the Applebaum teaching repertoire. Some of these have been hard to find. Volume I progresses from Level 1 to Level 2, Volume II progresses from Level 2 to Level 3. The solos are useful for teaching technique, dynamics, phrasing, and overall musicianship. 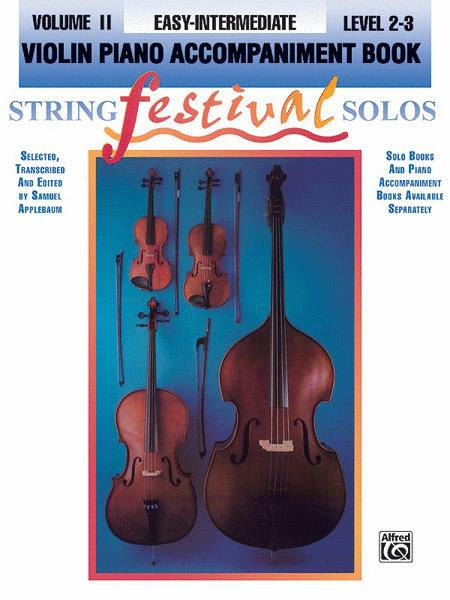 String Festival Solos are excellent for recitals, auditions and performances for assemblies, concerts or festivals. Contains: Theme and Variations (Papini) * Rondo (Mozart) * Gavotte (Sitt) * Hungarian Suite (Bartok) * Elves' Dance (Perpetual Motion) (Bohm) * The Rain (Bohm) * Bouree (Bach) * Two Guitars (Russian Gypsy Folk Song) * Allegro (Vivaldi). This collection is made up of excellent classic teaching pieces that have been used for generations, and some of which were out of print for many years. Students of all ages will enjoy this book.